Being multi-cellular has advantages. Specialization of cells for different jobs is one advantage– akin to humans adopting agriculture, freeing up some of us to do other things. Multi-cellularity is also quite challenging as those cells have to communicate well together and there are more cells to feed/keep healthy. Different cells have to be able to communicate to their neighbors, but also over longer distances to determine just how to respond to their environment or developmental cues (e.g. flowering time in plants). Plants have this problem too. When a leaf emerges from the meristem or a seedling germinates and its seed leaves (aka cotyledons) unfurl and expand, cell division and differentiation take place. Leaves (& stems) have specialized cells called guard cells that pull water up from the roots and are involved in gas exchange– losing water & oxygen to take up carbon dioxide (CO2). The global activity of stomata is what’s responsible for the rise and fall of CO2 levels each year as the seasons go by (high in winter when plants are dormant, low in summer when plants are green). You can read more about the embedded video at NASA. Two guard cells form a pore that can dynamically open and close depending on the internal pressures in the cells– high internal pressure, by forcing water uptake causes the cells to straighten and close the pore. The more open the pore, the more water that evaporates and the moreCO2 that can enter. Plants build themselves from the air, incorporating the carbon dioxide into sugars that then form the backbones of all the organic molecules that make them up. Source of video: Veritasium, showing how big trees get water from the ground up to their crowns. Guard cells are not present within seeds. They only form after a seed germinates, or a new leaf buds from the shoot meristem. In a population of uniform epidermal cells– yes plants have a surface layer of cells called the epidermis like animals– have to differentiate a subset of them into guard cell pairs. It doesn’t make sense for the whole leaf surface to be made up of guard cells, and if they’re too sparse, they may not sufficiently fuel the plant’s metabolism/function. The density of guard cells may also depend on environmental conditions. In hot, dry times, a new leaf may develop fewer stomata so the plant will keep more water inside (alternatively, stomata just may remain closed), but that will likely sacrifice fast growth. Just how plants switch on and maintain spacing of guard cells has been an active area research. This week in Nature (ref 1), researchers at the University of Washington have published findings on the sophisticated strategy plants use differentiate guard cells. Another thing it highlights is the spatial importance of signals and how that may be a critical factor in the process. Thus plant cells can determine where a signal comes from. As I’ve written before, to perceive a developmental signal requires a sensor for that signal. In the case of guard cells, there are several signals in the form of peptides (they’re genetically encoded, and are expressed as proteins): EPIDERMAL PATTERNING FACTOR1 & 2 (EPF1 & 2) and Stomagen (also known as EPIDERMAL PATTERNING FACTOR-LIKE9). And recognizing those signals are a several receptors: TOO MANY MOUTHS (TMM), ERECTA (ER), ERECTALIKE1 (ERL1), and ERECTALIKE2 (ERL2). Figure 1 from Lee et al. 2015 (ref 1). Stomagen increases stomata density when over-expressed and density is decreased when there is less stomagen (stomagen-ami). This effect is only seen in wild-type, not in mutants for receptors tmm and er erl1 erl2. The cellular part of how undifferentiated cells become guard cells is that a protodermal cell (pre-epidermal cell) will get a signal to become a Meristemoid Mother Cell, an MMC for short (otherwise, it will become a pavement cell). The MMC then undergoes an asymmetric cell division to form a small meristemoid cell and a larger stomata lineage ground cell (SLGC). Meristemoids can become guard mother cells (GMCs) that undergo one more cell division and become a pair of guard cells or divide again, maintainng MMC identify a bit longer. There are some other patterns that can happen, but that’s the basic pathway and the general rule that is followed is that pairs of guard cells cannot end up adjacent to one another. The idea is to space them out evenly across a leaf’s surface (For more on this, see reference 2). How do these signals and receptors fit together to determine the placement of guard cells? It turns out to be a complex story. EPF2 and EPF1 usually repress development of stomata, with EPF2 repressing the early transition to meristemoid formation and EPF1 acts a bit later, enforcing the spacing rule in ultimate guard cell formation. In both cases, they act through ER, ERL1, ERL2 and TMM to repress guard cell formation. 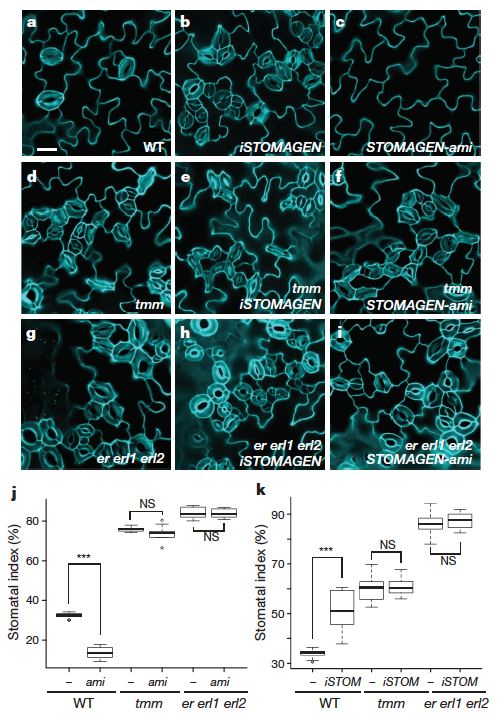 The Nature paper hows that stomagen, a very similar peptide to EPF2 and EPF1 binds to the same set of receptors with the opposite result: it promotes the formation of stomata. Just how each signal elicits opposite responses from the same receptors isn’t known yet. They show that raising or lowering the level of stomagen in plants lacking TMM or all 3 of ER, ERL1 and ERL2 means losing any change in stomata quanitity when stomagen is present. Another interesting result in this paper is that Stomagen can outcompete EPF2 for binding to the receptors. Another interesting result in this paper is that Stomagen can outcompete EPF2 for binding to the receptors. Thus, it could be the negative signal of EPF2 early on is the ‘default’ state while stomagen, which is generated from inner layers of the plant can selectively compete away EPF2 binding until a threshold is reached to adopt final guard cell fate. Stomagen does not activate known downstream signals that EPF2 does, suggesting that stomagen has its own downstream signaling cascade inside of cells undergoing guard cell differentiation. Just what the key differences are in Stomagen vs. EPF2 and EPF1 remains to be seen. A next step of this work may be to start inducing mutations in either EPF2 or Stomagen to make them more similar to one another to see which changes make these peptides repress or elicit guard cell fate. Another interesting factor is the spatial aspect. EPF2 and EPF1 are made and diffuse through the epidermal layer of the plant while stomagen, as the authors note, comes from non-epidermal cells inside the leaf. This bottom vs. side input could be an important factor in cellular response too. This work does have implications for what Maddie Stone wrote on Gizmodo this week about plants being key to space travel, in part for gas exchange (not to mention food). Plants take in the CO2 we breathe out and the plants produce oxygen that we breathe in. Understanding how plants take in CO2, use water, and release oxygen are a key part of the equation in building a workable eco-system. This also means really studying the biosphere of the Earth closely– down to the molecular level as the Lee et al. paper does– plants included. I’ll leave with this: In tropical rain forests, rains are frequent. Each day, plants, large trees, take up water through their roots and it releases into the atmosphere via open stomata that also take in carbon dioxide. The amount of moisture released into the atmosphere causes clouds to nucleate and rain back down onto the forest. Guard cells can alter the weather on Earth.